“I never said nothing about love,” Jeff says to his team, referring to the love he has, in fact, been talking about all morning. (Jeff wants a wife.) A cowboy on a cattle drive has time to ponder such matters. “You’ve known her for a whole six days!” one shoots back. “Eight,” Jeff says, slapping his chaps. “I’m telling you, she’s awesome.” He whistles through his teeth. The cattle move as one, a rumbling blanket of rolling amber, humming their lazy cow songs: aaaroooom, aaaroooom, aaaroooom. Beef, even now, is still personal, is cultural, is cowboys. It isn’t like pork or poultry. Commercial pigs and chickens live their whole lives in industrial-size barns. Beef, in its beginning stages, will never be produced that way because a simple fact remains: all cows eat grass. You need land to grow calves. Lots and lots of land. That land is divided among many owners. 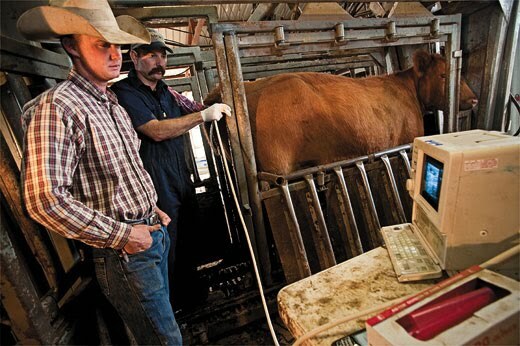 Beef production is unlike any other agricultural industry in that it has remained utterly dependent on the family farm or the extended-family farm, manned by the same people who sing in the church choirs and run the school boards and football leagues that knit the fabric of small towns like Throckmorton. 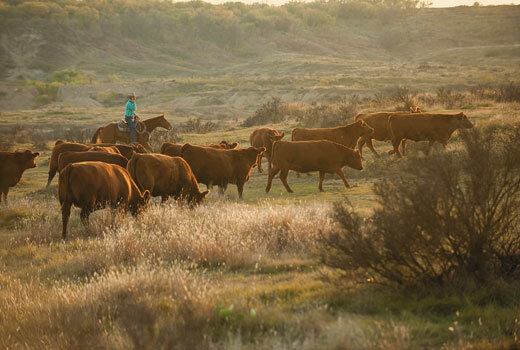 Beef production is the largest single segment of American agriculture, a $76 billion industry, and yet more than 97 percent of U.S. cattle ranches are family-owned and -operated." click the link above for the entire article. 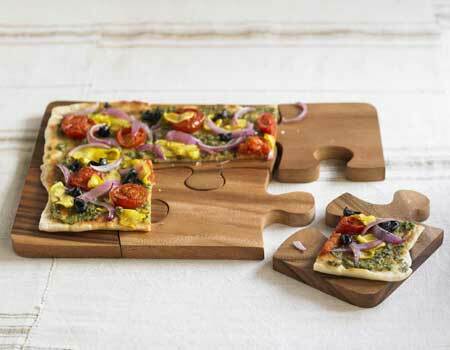 click here for more photographs from the article. and you can tell this kid's from texas!! 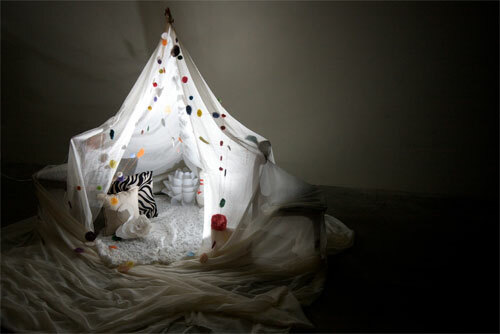 check out the collection of blanket forts on oh, hello friend. i never thought about their photographic potential! i think they make sweet and different engagement photos. well, the wind quit. we went from gusts of 60 to 70 miles per hour yesterday, to 8 mph this morning, although tonight, tomorrow and tomorrow night there's a 90 percent chance of snow. that's good, though, we need the spring moisture. the state's sitting at about 70 percent of average. wyoming has the unique topographic circumstance of being the 'top of the watershed,' meaning that with our elevation there are no streams or rivers flowing into the state - everything flows out. that means we rely heavily on snowfall throughout the winter and spring, which builds up the snowpack in the mountains. the snowpack serves as a frozen reservoir, of sorts, holding that water up high until it melts out in late spring, filling reservoirs and irrigating farm and meadow lands. about this time of year is when wyoming gets a lot of snow - its infamous spring storms. and it's a wet, heavy snow with a lot of moisture content. the hydrologists that track snowpack in the mountains measure the snowpack weekly according to snow water equivalent (swe) to give an indication of how much water is held in the high country. the map released by the natural resources conservation service (nrcs) divides wyoming into watersheds - the basins created by mountain ranges. 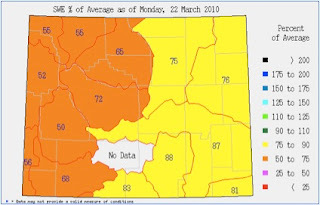 the one white area with no data isn't reported because that's the great divide basin in the red desert area, which is isolated and not counted because no water flows from it. most of the basins in wyoming are named for the major rivers that flow from them. although snowpack is currently at 70 percent of average, i think bureau of reclamation wyoming office director john lawson is ok with that. when i visited with him last spring - which was extremely wet - he said another spring like 2009's and he'd have problems with too much water. the bureau of reclamation is the federal agency that owns and manages the large reservoir projects in the state. so, it looks like we'll be in for some more cool weather and clouds in the next few days, but hopefully we'll get some moisture out of it and next week's monday morning snow report from the nrcs will show a few points of increase. i know puppy lucy won't mind if it snows again - she goes nuts for snow. i really am busy getting this week's paper organized, but i just had to pause to share this photo with you. 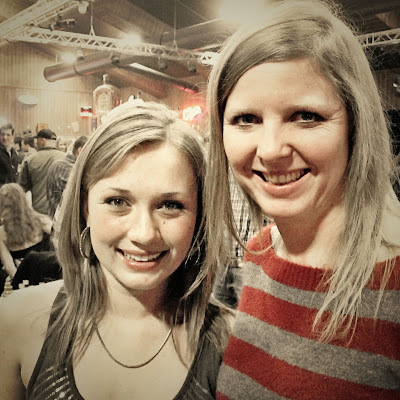 my sister m took this last saturday at the miniature bull riding event she covered for the roundup. just give these guys another 12 years and they'll be trouble, especially if they keep riding bulls. except for maybe the one on the left. he looks like he may not be developing quite the swagger and attitude as the other two are. i'm looking forward to reading her article, and seeing the quotes she got from them. because the wind's blasting 60 mph for the second day today, there's not a lot going on in casper, wyoming, except for not even trying to wear one's hair down, and ensuring one has a firm grasp on one's mail when walking back from the mailbox. in house news, went over the inspection reports with my realtor yesterday afternoon, and i'm asking for about $1,500 in repairs, mostly minor things like an ant treatment and upgrades on some of the outlets. the next step is to call my grandma h, because she's the one who will loan me some cash, and work on getting house insurance set up. my litter box won't have to be in the bathroom anymore!! try as i might, it's hard to keep up with cleaning up after kitty litter toes. there's a little kitty door in the door at the top of the basement steps, and i plan on putting their litter box downstairs, either in the common area with the furnace, or making a spot for it in the laundry room. one downfall is that as it is now it's hard to forget to clean it when it's sitting right where i see it all the time. so this was the march 27 paper. after much phone calls, interviews and writing all week long, we got it filled, and with just about everything put together ourselves. 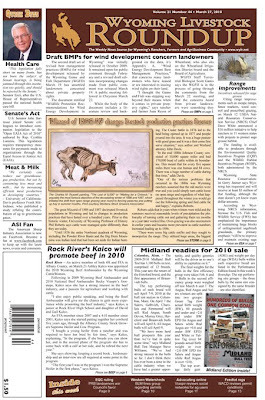 our first deadline for last week was for the midland bull test performance edition - the cover of it's posted there in the lower right corner, our 5 spot. most of it was filled by the results of the top bulls on test from 10 breeds, but it still took more articles to fill than i thought it might. or hoped it would. this week's cover featured new wind development 'best management practices' recommendations from the wyoming game and fish dept, which have upset private landowners. 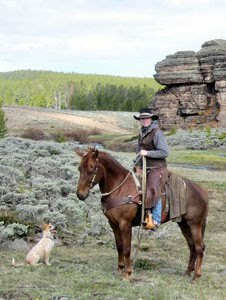 i also wrote the one about the funding coming out of d.c. as incentives to private landowners to enhance sage grouse habitat, as well as the article on the 2010 beef ambassador, who is sponsored by the wyoming cattlewomen. the 5 spot is a summary of the midland bull test that i put together. assist editor h was really busy earlier in the week writing most of the midland articles, so in the regular weekly she only had the one cover article in the 2 spot, about how cattlemen changed their cattle management practices from open range year-round to a fenced situation, with hay fed in the winter. the print of the starving steer with wolves in the background relates, because now-famed western artist cm russell painted that during the tough winter that shifted how cattle are produced in wyoming. this week's cover spot will probably feature an article and photos by my sister m. she went to a miniature bull riding event in lander on saturday - yes, it features miniature brahma bulls and young kids competing against each other. and yes, there's now a circuit and regionals and national championship. i'm hoping she got some great photos, because an event like that has a lot of potential. otherwise we're 20 pages again this week, and that includes two full-page ads from the pathfinder wind people. but, i've learned not to make the mistake of being optimistic and thinking it'll be easy to fill papers. if i am, then i end up way behind on about wednesday evening. next week is our annual spring planting edition, and one that i need to get a head start on because it's a short work week for me. 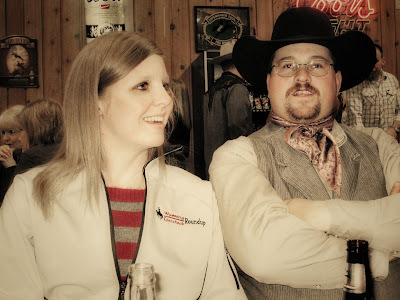 taking thursday and friday off to travel to pocatello, idaho to the dodge national circuit finals rodeo with the him, brother b and becky. we're driving over on thursday and coming back to town on sunday. it should be a lot of fun, and i look forward to taking a lot of photos. i've only been a few miles into idaho once. because of the house-buying foray, i won't be able to buy a lot at the wonderful trade show and tack shops, but i do plan my one purchase to be a nice set of spur straps for my new spurs. what do you mean, visiting? so, friday evening i went to the beacon with the him. we arrived just before 7 and commenced to have steak for dinner. after a while we were joined by others, until our group was about 10 people. brother b and becky came in from the ranch, and friend woody from meeteetse was in town, friend eddy was there, and friend stuart, among others. so we all sat around and visited and got up and danced regularly. at one point i went over to talk with bouncer friend kyle, who was taking the cover and checking IDs at the door. 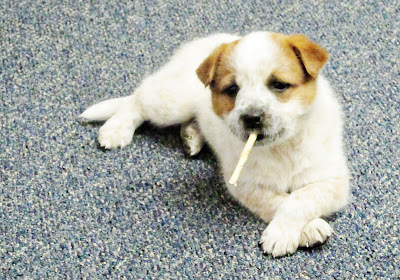 he told me the cops had really been harsh lately, with four or five of his friends pulled over in the last week. the him and i left about 1:30 a.m. he'd left his truck at the apt, so he was riding back across town with me. there were a couple vehicles following me as we headed east on yellowstone, and sure nuff, we got almost to poplar and lights came on behind me. i was very baffled, as i was going 50 on the dot and was just driving along minding my own business. so the cop comes up to the window and i've dug out my license. cop: "do you know why i pulled you over? you were all over that yellow line driving down the road." me: "oh, i'm sorry. we were just visiting as we were driving home." cop: "what do you mean, visiting?" me: "um.... talking to each other?" isn't that what the term "visiting" means to most people? and just for the record, i'm pretty sure i hadn't even touched either paint line, he just wanted any excuse to pull me over. pretty sure he was sitting in the shadows watching the beacon parking lot. the mills cops are low-down and dirty like that. obviously he knows we've come from the beacon, and he asks how many i've had to drink. and really, seriously, who keeps a running tally when they've been at the bar six hours? anyway, i gave him a low estimate, noting that we'd also had dinner there, and i was just giving the him a ride. that, and it'd been over an hour since i'd had my last one. you know how long it's been since i've had to recite the alphabet? well, he made me do it under pressure, with lights flashing in my rearview. then i had to count backwards from 67 to 54, and then recite the alphabet from 'c' to 't.' sounds easy enough, right? but when it's the middle of the night and dark and a cop's standing there shining the light, that adds a little bit of pressure and one starts overthinking. but, i passed. he took my license back and checked it out, then let me go. so yesterday we all went to the bull riding at the events center, and i didn't even go to the bar afterwards. figured i'd maybe used up my luck for the weekend. there were a lot of casper and mills cops out, and the sheriffs. a good night to just go home and go to bed. besides, after the performance me and the him, brother b and becky and their uncle sonny and his wife carole from kaycee - friend G's parents - all went to casper's for coffee and visited until after midnight. 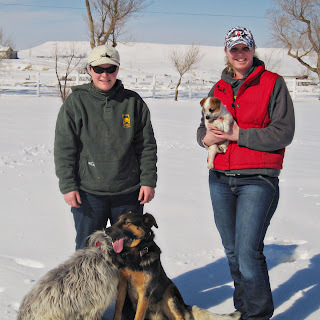 otherwise, yesterday morning i came into the office for an interview with the buffalo ffa ag issues team, then went out to the ranch with lucy for a while. she wanted to play with her sister puppies out there, but they were scared of her. i think she's a little overbearing and confident. since she goes so many places, she settles into things and gets comfortable pretty quickly. 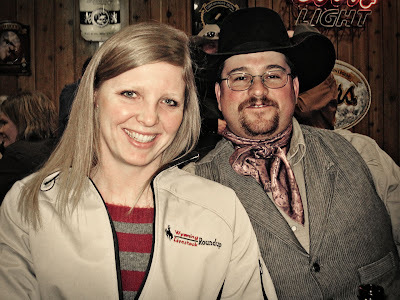 then the him, brother b, becky and i went and had mexican for dinner, then headed to the bull riding, where we joined up with the mutton marshall and his wife dorothy. right now i'm at the office, getting ready to clean. then the rest of the day *should be* devoted to cleaning the apt. since my mind's been set on moving, it's been neglected since i'm thinking that soon i'll be packing everything up and organizing it, anyway. 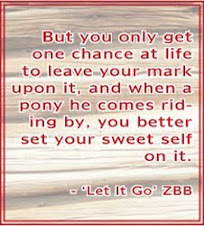 maybe today is warm enough to take my horses out for exercise. i took them out thursday evening after work. i saddled april and was riding her, leading jazz. but jazz has this thing were about once a year when i'm ponying her she decides she's going to launch an all-out attack on april, biting and rearing and kicking and she just won't give up. if i knew how to anticipate it, i could work on fixing it. so anyway, i might take them out separately today, because i don't want to get kicked in the leg or hit in the head with an attacking hoof. the him and brother b are helping the mutton marshall move his cows to spring pasture today. i opted out, as it's guaranteed to be a long, drawn-out ordeal and not much time horseback. that, and they were all a little peeved with each other last night, so a good day to stay out of it. i approve of the happy lady quotes. so inspections were at 1 p.m., and everything went smoothly. we had the sewer, electric, plumbing, heating and bug inspectors come, and none of them raised any major concerns. my realtor says the roof guy already looked at it, and he said it was good to go, which suprised me. i took lucy with so she could give the place her stamp of approval, and coworker jody also came along to take a look, since she hadn't been there yet. we talked about all the possibilities there are for planting flowers and shrubs and big pots of flowers in the front yard. she's concerned about getting the right protectant on the deck, which is valid. the top of it's painted the same green as the trim, it's just the horizontal sides that would need a coating to spruce them up. so anyway, the next step is getting with the closing agent to go over the inspections and decide if i'll ask the seller for any improvements finished before i move in. i'm still very excited about the kitchen. and the wood floors in the open living/dining rooms and the bedroom. 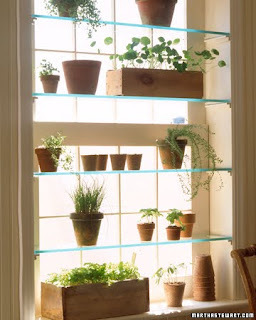 because that one kitchen window in my house-elect faces south and is unobstructed by trees or other buildings, i could put shelves across it, kind of like in this photo from marthastewart.com, and in the winter hopefully my herb garden would get enough hours of sunlight to keep producing through the cold dreary months. 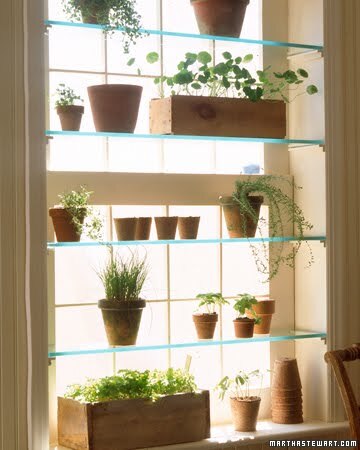 as the website says: Instead of spending the winter gazing through glass panes at frozen flower beds, transform a window into a mini-greenhouse where herbs, houseplants, and even little pots of grass will thrive. a week or so ago my mother sent me a box from iowa. it arrived at the roundup address, and in it i found a new package of caribou coffee and a collection of napkin rings. 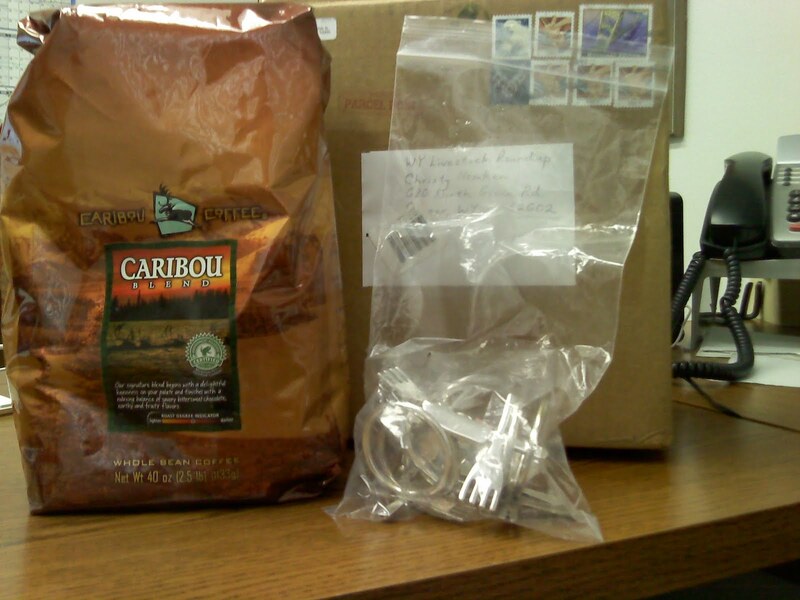 since caribou coffee is not to be found in wyoming, she replenishes my supply when i run out. although, with this last round, postage is getting rather expensive and we might have to rethink that arrangement. the napkins rings are a part of my birthday gift - she found them while thrifting. aren't they unique? i like that they're different than anything i've already got, and they're simple. 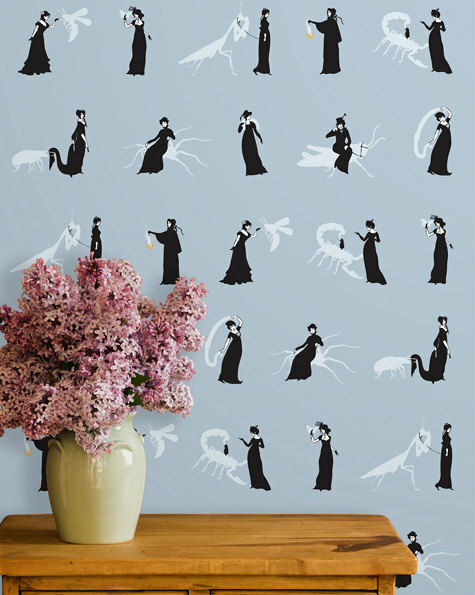 this wallpaper was posted on design*sponge yesterday. it scares me. in every image it looks like the nice woman in the glamorous black dress is about to be attacked by a boone & crockett monster bug. i, for one, will not put this anywhere in my house, now or in the future. a double sink! i've lived with a single one for almost four years and hate it when i forget to dump my coffee mugs before filling it up with clean, hot, bubbly soapy water. or strain my vegetables. or any number of things. though i almost hate to say it, i've gotten used to it. i can have a deep freeze!! the refrigerator in my apt is small to begin with - only about five feet tall, it seems like - and that means it also has a mini freezer. not suitable for someone accustomed to having large amounts of home-raised beef and pork readily available. i'll actually be able to freeze leftovers and bread and have plenty of frozen vegetables on hand. i love cooking with lots of vegetables. this is a photo i've been meaning to share for a while. i apologize that i lost track of where it came from. 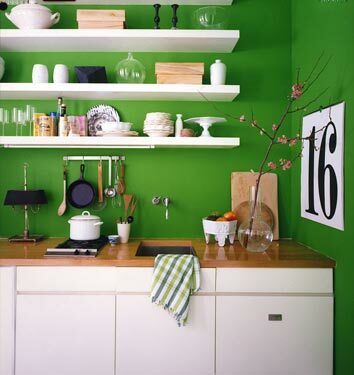 i love the bright green with the white accents in this kitchen, as well as the open shelves and the small bar mounted under them from which the utensils hang. i'm not sure what's going on with that mini burner set and the little white pot - maybe it's a setup for a bar? 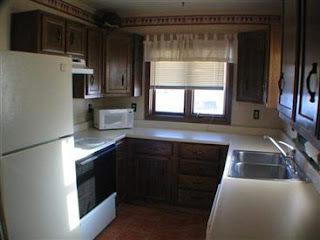 or just a tiny apt kitchen? at any rate - i love the colors. i wouldn't be able to do this is my new house, though, because the color's a little too bold and contemporary for the mustard yellow that's more country-ish in the living room, to which the kitchen is open. also, a bunch of the trim, like in the dining area, is painted a dark green, almost a forest green. that, and all my kitchen utensils and appliances and accents follow the kitchenaid red theme. 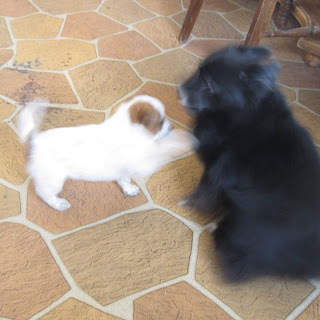 the day assist editor h and i went out to friend francy's house to pick lucy out of the litter of seven pups... she was not even four weeks old yet. i've had lucy for four weeks yesterday, and i took this photo on my phone right as we got to the barn to feed the horses after work. yesterday was the cold, wet miserable day, and she's not a fan of it being wet outside, but the horse barn is enough higher in elevation that there were several inches of snow accumulated there compared to the office, and she was more than willing to get out and run around in it. i love how her goofy ears are almost trying to stand up now. for a while i wasn't sure if they'd stand up at all, but she's working on it. their half-flopped state gives her a lot of character, and makes it hard to take her seriously. both photos were taken on my lg chocolate touch phone. the top photo isn't anything special because i was driving at the time, but i like how sharp the bottom one is. i'm very impressed with the quality of the camera, and it's easy to operate and change the settings. i like the phone as a whole, except in texting the T9 Word works a little different on it from my last lg, and i liked the last one better because it'd remember new words you typed for future use. as i wrote yesterday, the deadline for our editorial in the midland bull test edition is due at noon today, and i think assist editor h and i already have the bulk of it done. all that's left on this end is getting a few changes from a couple of the article subjects. i finally got the bull test results in my email last night, so i spent the evening editing and formatting just over 6,000 words of EPDs from 10 breeds of bulls. i talked to layout girl t first thing this morning, and sounded like that end of it was going well. 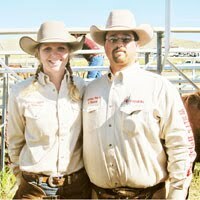 the couple in the photo here are steve and lindsay williams, managers of the bull test. his father-in-law is a founder, thus their connection. i interviewed them on a conference call, a new experience because steve is deaf. lindsay translated his quotes, though, and it worked out just fine. since i got a couple of my midland interviews done and the articles written early yesterday, the rest of the day i dedicated to phone calls for the regular weekly. i was on the phone a lot, and that's a good thing because i got a lot of interviews taken care of. last i heard from coworker jody, we were 59 percent advertising on 20 pages, which means we could be easily pushed to 24 pages. generally we run about 55 percent advertising. anyway, enough about the newspaper. i've even been dreaming about it..... the other night i dreamed they told me the regular weekly would be 30 pages. things with my home-elect are moving along. i heard from my banker this morning, and they had the appraisal lined up, and had received the contract from my realtor, along with some of those other details, and he said things were going well. inspections are thursday at 1 p.m., so i will go over there to see what they have to say about how my house is hopefully not falling apart. i keep having the him drive past it when we're out and about town to see if there's a 'sold' sign on it yet, which i thought there should be since it's under contract. but nope, not yet. i want to take a picture of it as proof - and maybe to myself - that it's mine. after several days in the 50s, today is cold and wet and snowy and breezy and generally not very nice. puppy lucy is not a fan - after taking her out earlier this morning, i had to drag her from under the couch when it came time to go back out and get in the truck for work. thanks to having a baby dog in the house, i now consistently get out of bed on or before 5 a.m. and actually, i kind of like it, because i have time to start the day with a cup of coffee and some reading before showering and heading to the office. it's relaxing. oh! and the big news of yesterday is that my birthday spurs with my C } brand are done! thus, the him and brother b and i are planning a trip to riverton saturday, to get my spurs, the him's bit and brother b's bit and spurs. and friend nick's bit. talk about a pricey trip. :-P the him said his total is $700, but his is a pretty elaborate spade bit, so i'm sure my spurs are a fraction of that... or that's what i'm hoping. i'm looking forward to seeing the silver floral pattern that i chose for the shank and button of my spurs. pictures will be forthcoming! so here we are, monday morning's already almost over, and we're hard at it. working on our midland bull test edition first, for which the editorial is due by noon tomorrow, ideally. it's been a fight to get the information and interviews, but it seems to be coming together. somewhat. following finishing this special edition, we've got the 20-page regular weekly to fill. this last weekend i spent part of both days at the office, helping put together ads for all the consignors who had bulls in the test and are selling them at the sale in early april. but it wasn't all work and no play, as the him and i hung out for a little bit yesterday, including red lobster with his sister and her kids, a movie and ice cream. and for saturday lunch publisher d brought me and jody take-out from olive garden, and that was much appreciated. and now i must get back to work. here's the cover of the 28-page paper. it looks nice, i think layout girl t did a good job. and assist editor h took the lead photo, which made a nice feature photo for the cover. 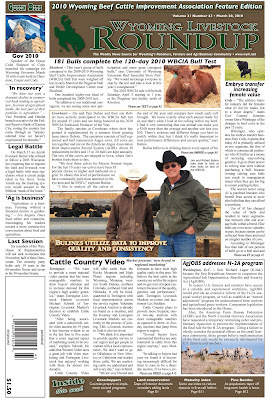 now i get to start stressing about the march 27 edition, which features another bull test in montana. at least it should have more results to fill more pages..... but still stressing. we'll have a 16-page special edition and a 20-page regular weekly. tomorrow i'm coming into the office to help coworker j and layout girl t design ads for the edition, as well as do an interview, whose story will go in the special. i've got a lot of stuff started for next week's regular weekly, so we'll see how successful i am getting a hold of people for information. 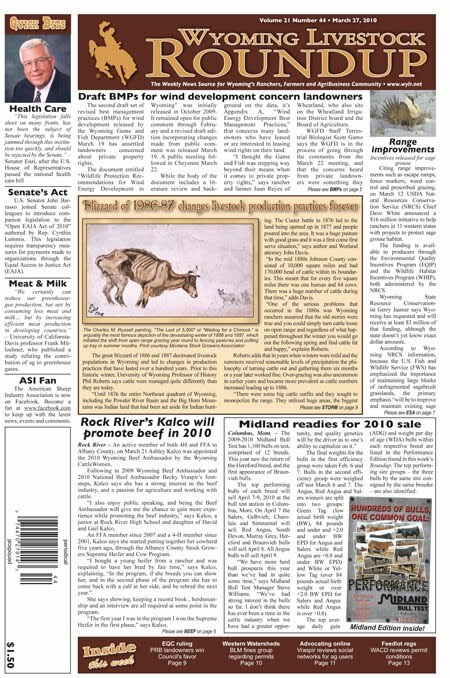 there's one on what the beef checkoff is doing for 'earth day,' one on how the enviros are in trouble with the blm in idaho and another on a ranching couple in northeast wyoming's powder river basin, and how they recently won an argument about whether or not coalbed methane discharge water should have been allowed to flow across their land. yes, that is a small part of the troubles ag producers face in a mineral-rich state with much extraction. if i disappear, assume i ran far, far away for a while. come get me when it's over. sooo.... that little yellow house on lincoln? well, tentatively. pending several inspections and approval from my dad. 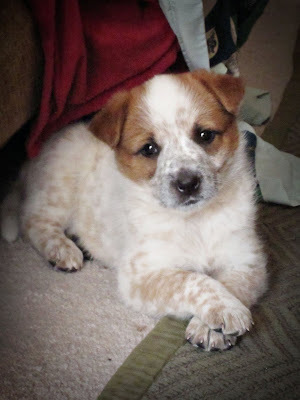 he's very concerned that i can't afford this, and he wants final approval, so it's in the contract that he has to approve it before april 7, and i guess that means he's planning a trip out here. although i'm scared spitless and nervous about taking on such a big responsibility, i'm ready for it. and way ready to move out of this apt. i was ready to move out of it a year ago, and for sure before this winter started. i'm tired of leaving the office every weekday and coming home and trying to park my big truck in a line of cars like i'm at walmart or something. i'm tired of hearing people walk up and down the stairs just outside my bedroom wall. i'm tired of people walking in the apt next to mine, and me thinking they're going to walk right in my door instead. i'm tired of the college kid upstairs who plays his music and movies loud, and i'm tired of not having a good place to let my dog out. and i'm tired of getting my mail with a key out of a conglomeration of mailboxes. at least i did finally get myself a washer and dryer. hauling my laundry up to the communal machines by the office was a pain, esp in winter. anyway, the point is that nearly four years in a small apt, when one is not in college, is more than enough. i guess that was my main motivation for buying this house. and, i'm almost paying my mortgage payment in rent already, and i'm in time to get the $8,000 credit from the feds. and, this house is set up perfect for leasing the living room, bed room and bathroom downstairs. and it's a mere four blocks for the college, so that should be easy. that, and it has tons of character with the architectural detail on the exterior and the wood floors with brick detail inside. 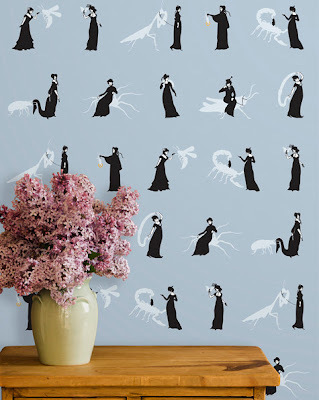 that, and the lady that owns has taste pretty close to mine, except she obviously was a fan of wallpaper borders, and i am not. i'm already making plans for planting daffodil bulbs in the flowerbeds. and cupboards!!! there are double the cupboards in the kitchen than i have now! i'll be able to spread out all my cooking pots and dishes and utensils and the counter space is fabulous, and there are two windows in the kitchen - one facing east and one facing south above the sink, so there's plenty of natural light. i told the him that i was going to get my stash of boxes - which i've collected and saved for such a time as this - and start packing. he said i shouldn't get ahead of myself. :-) at least he's around to be a voice of reason. and you know what else he said? "you'll have to get more furniture to fill the space in that house" ........ he looks around my apt ........... "on second thought, i think you probably already have enough in here to get it done"
what can i say, i love used furniture with character, and i can't resist purchasing a good deal that i know will be useful and perfect later on. right now the laundry room is pretty unfinished, but there's extra space in there, so maybe i could clean it up a little bit and have it be my sewing/project room as well. i've always wanted a place where i could leave everything set up, because now when i have things to work on, my dining room table is the only place and i hate leaving it all strewn about. so anyway, now you're up to speed. today i need to get house insurance quotes, and get my banker the last of the requested documents..... i know i save all my W2's, i just hope they're where I think they are. and, in the midst of this, assist editor h and i successfully filled 28 pages of newspaper this week. you'd think i could pick a simpler time to purchase a house!!! The warm temperatures and sunshine that is covering Wyoming is going to give way to a strong and cold storm system plunging south out of Canada on Thursday and Friday. This storm system will bring a dramatic change in the weather beginning in northern and central Wyoming Thursday with areas of rain and snow and possibly even a thunderstorm. The worst weather will develop Thursday evening and Thursday night in central Wyoming where heavy snow will be likely in places like Casper, Douglas, Riverton, Lander and Rawlins. By Friday morning, heavy snow may be found along the I-80 and I-25 corridors of eastern and southeastern Wyoming. Snowfall of 4 to 8 inches will be likely on the plains of central and eastern Wyoming by Friday afternoon with heavier amounts of 8 to 12 inches possible in the mountains. Snowfall amounts will be lower across the far northeast and southwest areas of the state. Hazardous travel and livestock weather conditions are likely late Thursday through late Friday. thanks, don. you're a pal. otherwise, just working on filling 28 pages this week. i've got quite a few various articles going on at this point. little puppy lucy had a great time out at the horse barn last night. she's coming along really well, and is pretty responsive to basic voice commands. she doesn't have a long enough attention span to 'sit' yet, but we're working on 'stay,' as in 'stay over there on the towel on the passenger seat and don't come onto my lap because your paws are full of horse manure.' she's also pretty good at coming when called, and following me around, like when we're doing horse chores. sometimes she has lapses.... yesterday morning she had a puppy dilemma when we were walking into the office and i was telling her to follow but the poor girl really needed to relieve herself before coming inside. that put her out of sorts for a few hours. last night was elk steak marinated 24 hours in italian dressing, green beans and whole wheat rolls. the elk was really good - i grilled it on the small grill that roommate a left on my patio. last time i fixed elk it was under the broiler, and it wasn't nearly as moist and tender when done. this time around it wasn't gamey at all with the grill and marinade. def worth doing again. 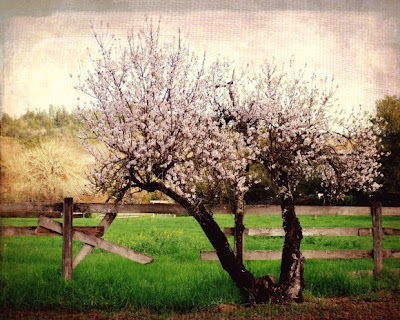 is anyone else looking forward to spring as much as i? 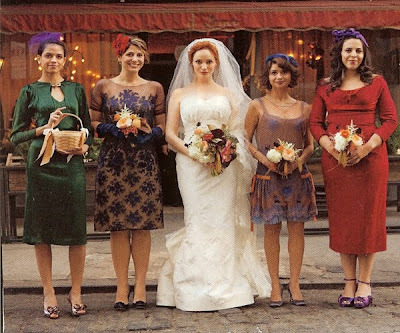 i love the post production on this photo, found on etsy, posted by honeytree photography. i don't know that anything is more lovely than a warm, sunshiney saturday that begins with waking up slowly, brewing coffee and enjoying it with yesterday's rhubarb walnut muffins and the company of a playful pup and a boy cat with an attitude. i think the girl cat's still in bed. i don't know if you remember the yellow house that i went to look at last spring. well, i went to see it again yesterday after going to talk to the realtor again. i really can't believe it's still on the market. it's pretty much an ideal place for me, with a good kitchen, wonderful hardwood floors upstairs and a perfect living area/bedroom/full bath setup in the basement, which i could lease out. it's even already got a brick pad and stovepipe put in for a wood stove in the living room. as the him points out, in a small living area like that, it wouldn't take much to heat it with the stove. friend g put one in his place about a year and a half ago, and it really is effective. the house also has a lot of good windows, and is lit nicely with natural light. upon taking another look at the yard, the weird deck thing on one side of the house could be taken out, and actually provide a sizeable piece of yard, already fenced with a tall solid wood fence, for lucy. it doesn't need a lot of work, but there are a lot of projects i could take on that i'd feel comfortable handling. i also went to see a really great old house with an amazing front porch, architectural details and original hardwood floors and trim inside. it has a lot of potential, and someone could make a lot of money on it if they wanted to take the time to undergo some substantial renovation. the kitchen's about 10 square feet and no counter space, but could be easily expanded, and the basement ceiling is only six feet and is pretty much a dungeon. and even less yard than the yellow house. 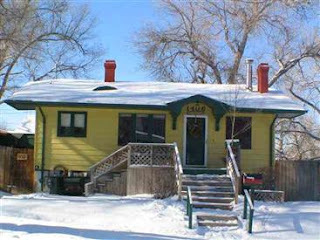 but, someone should do something with it, because the houses around it also have a lot of character and are really nice. i, with no carpentry experience, am not that someone. me: oh you're going to put it on? i thought you lost it. the him: well, me and bobby think it's somewhere behind the shop in that snowdrift. 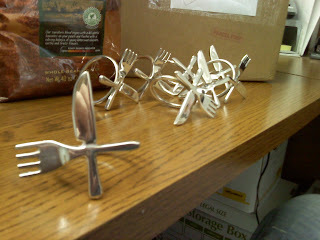 they're also going to build some branding irons today, including my C } ! that's exciting. once my horses shed out a little more we'll brand them, and it'll be official. last night we went to a movie with the mutton marshall and his wife d. it was a nice, relaxing evening. i had thought about going over to the beacon afterward, but was too tired and came back to the apt and went to bed. prior editor jennifer wrote the wind development article, while i wrote the update on the sage grouse's new 'warranted but precluded' status under the endangered species act. the main article is one that dropped in our laps as a tip from assist editor h's dad, and ended up being the main article. nice when that happens. she wrote that one, as well as the sheep paint article in what we call our '4' spot. 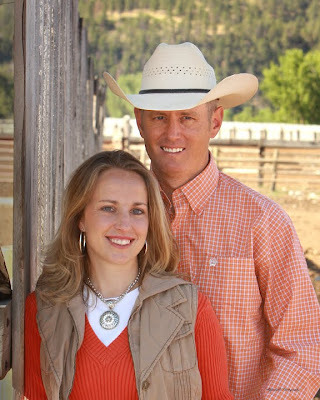 the '5' spot has a meeting announcement that wyoming's 2010 national beef ambassador will lead a meeting in lander on how those in the ag industry can get connected online so their voices can be heard alongside everyone else's. maybe i should explain how putting a paper together works - or rather how we make it work for us. a few years ago prior editor jennifer and i designed this layout for the cover, and i like it much better. each spot is numbered, with 1 being the very top, 2 the big middle article, which always features photos and/or graphics and 3 being the column running down the right hand side. 4 is the lower left place, while 5 is the lower right. not really logical, but we all know what we mean. the 5 spot used to wrap to inside pages just like everything else, but since i became editor we've started making it a short blurb, some sort of news feature with a photo on whatever random thing we think is most interesting that week. i decided to make it a shorter one, because, in my informal rancher surveys and in my personal experience, i find people are more likely to read short, quick, to the point things first, then the longer articles if they have time. the 'quick bits' column that runs down the left side was also new with the redesign, and i really like it. 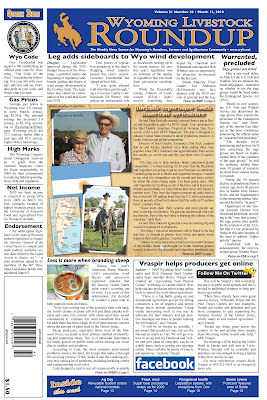 it's a way to draw attention to our cover and, again, a way to provide concise news that busy ranchers will read. i try to pick interesting facts, number, quotes, or whatever to put there. again, whatever i think is most interesting. i spend a lot of time each week searching for, editing down and compiling the quick bits and what we call our 'news briefs' inside. the quick bits are relatively easy, because there's only a few, and 200 words max, but for the news briefs i have to find a minimum of 2,000 words, and each brief can only be 200 words long at a maximum. a lot of them come through on email press releases, which i file throughout the week. running across the bottom of the front page is what we refer to as the 'inside box.' it has short titles and descriptions of articles included on our inside pages. this is the thing i'm most likely to forget to write for layout girl tracy each week! seems like three out of four weeks she has to call or email asking for it, and that's when i go in search of that week's proof to find article summaries and page numbers to send her. most weeks it's pretty easy, but some weeks we don't have as much inside, so i think i've even used the calendar page in there before.... what can i say, i get desperate. you'll know it's bad when i use the classifieds in the inside box. layout girl tracy is the one who chooses the week's color theme, basing it off the photos we send her for the 2 spot for the week. she generally does a really good job, and it looks great on the computer monitor, but our printing service is somewhat lacking in quality control sometimes, and the colors come out looking really drab and not even close to what it looked like on the computer. there's no tried and true color combination, so it's a crap shoot every week. but, that's a small slice of what i do each week. it's always very rewarding to see it put together on the computer monitor - and the colors layout girl tracy chose - for the first time when we get our proof on thursday. and, since we're at this stage in the game, that means the weekend's not far away!! oh, i'm going to talk to a realtor again today..... he called my cell phone last night, and convinced me i should come in and go over financing. i had every intention of shutting him down, but, i am over my frustration of last summer an am getting that itch again. especially since every week my apt gets smaller. and i'm really tired of keeping carpet clean, esp with all the high-traffic mine gets. parker is friend h's son, and he's two years old today, and lovin every minute of being a birthday boy, so says friend h.
this is one of the photos i took of him when he and friend h came to visit last fall. 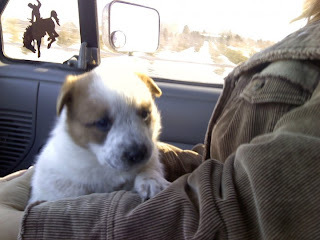 at this moment we were up at the association and he was curiously observing tyrone, the 20-something longhorn steer that will die of old age before brother b gets around to grinding him up for hamburger. 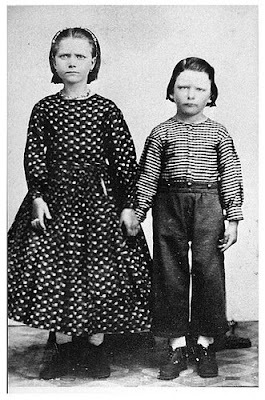 you should check out the pioneer woman's post, featuring old photos of young children. most aren't this scary, i promise. last night i traveled the 50 miles out to the grazing association with the him. the back way is 10 miles shorter, but they got a lot of snow out there in the last week and it's drifted in. 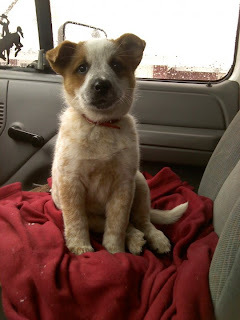 his brother b and becky were gone to meeteetse and cody, so it was up to him to look after the livestock. we were about to the ranch when i took this sunset photo from the highway, before heading down the dirt cut-off and dropping down into the headquarters. i went with him because it was a good chance to get out of town and away from my small apartment for the evening. it's quiet out there, and dark. 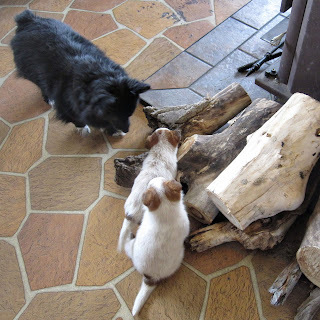 we enjoyed beef roast sandwiches for dinner and really didn't do a whole lot except hang out and watch my little lucy puppy and the queen of the house chiquita run in maniacal circles around the coffee table. it's been a few days since i've had a chance to post... this weekend was full of match bronc riding, shopping for new truck tires, going to a flea market, a baxter black show, going to the beacon, checking cows, running errands at the mall and hanging out with the him and sister m.
it was a good time, and good to see my sister again. she went to baxter black with us and took the loveseat i had bought at my favorite thrift store, odds and ends, back to lander with her. this last week when assist editor h and i went to odds and ends i bought a matching set of basic white lamps and shades for eight dollars each. my sister's dogs, miles and chip, also came to casper to visit, and new puppy lucy wasn't really a fan of how big they were. when we went out to let my horses out on sunday she ran around with them a little bit, but she was still intimidated. that, and miles would get after her with a sharp "woof" whenever he thought she was getting too whiny. and lucy has continued to be a well-photographed dog. here are a couple shots i took over the weekend. since she's getting older she's turning into a little turd. but at least she's still cute. for the most part, i like the wyoming legislature and i think they're a decent group of people who do a pretty good job with the bills that come before them each february. however, they've passed one this year that really rubs me the wrong way. it's on its way to the governor's desk, and he's already said he'll sign it. CHEYENNE–A bill making it illegal to text while driving has passed the Wyoming Legislature and is on its way to the governor’s desk. SF 20, text-based communications prohibited while driving, passed the House yesterday following spirited debate. The final vote was 32 votes in favor, 26 against and two excused. The measure makes reading or writing texts while driving a “primary offense,” one for which police can stop a driver, with a possible fine of up to $75. Gov. Dave Freudenthal indicated Wednesday afternoon that he would sign the bill into law. “I don’t think we have a Constitutional right to text and drive,” he said, adding he’s fine with passing the law for the sake of insuring the safety of Wyoming drivers. Before the House passed SF 20, numerous members argued it is a bad bill. “This bill, I believe, is really fraught with all kinds of loopholes, pitfalls and unintended consequences,” said Rep. Lorraine Quarberg, R- S Big Horn/Hot Springs/S.E. Park Counties. The legislation specifies that texting is not prohibited if the car is lawfully parked, if a person is trying to contact an emergency response vehicle or is driving an emergency vehicle. Rep. Quarberg said the measure contains exceptions that are unclear and nonsensical. She also questioned its enforcement. “This legislation is not going to make one whit of difference in the safety of our roads,” said Rep.Tom Lubnau, R-Campbell County, who also questioned the role of government in regulating citizens‘ personal safety. Proponents of SF 20 argued fervently that it will save lives. Several supporters of the bill said they knew people who had been involved in accidents caused by texting while driving. Rep. Del McOmie, R-Fremont County, said he’s heard law enforcement officers say increasingly more accidents are caused by drivers distracted by cell phones. “I’ve worked on things that were interfering with the rights of people but this one . . . if we save lives, it is the right thing to do,” said Rep. Pat Childers, R-Park County. A second reading amendment to the bill , which House members debated but did not pass, would have made texting a secondary offense — one for which a driver cannot be stopped. Much like the state seat belt law, texting drivers stopped for another offense such as speeding or failing to signal could have also been cited for violating the texting law. so, first of all, i agree with the guy who said the ban wouldn't make 'one whit of difference' on the safety of wyoming's roads. for one thing, i've seen way more people swerving and coming into other lanes and being distracted by small children in the back seat than by texting on their cell phones. is the legislature next going to ban having children in cars? what about eating and driving? what about opening the screw-top on a pop bottle? i agree that texting while in traffic is a bad idea, and i'd hope people would have enough common sense to know when they need to pay attention, whether they're texting or messing with their kids or eating or picking their nose. you can't legislate common sense. also, i know that people have been in accidents because of texting, but as far as i can recall they're mostly teenagers. instead of putting a ban on any text communication, perhaps the state should focus on better education of responsibility for young drivers who can't multitask while they're driving. so maybe the ban could have been by age, or within city limits. because i tell you what, you can practically read a book before the roads curve here in wyoming, and i think texting while you're driving down the highways cross country is perfectly fine. and, if a cop pulls a person over to ticket them for texting, what's going to stop a person from shutting down their phone and throwing it in the center console and playing dumb about even having a cell phone in their vehicle when the officer walks up to the window? and will cops be able to take your phone and go through your messages to see if you've texted in the last few minutes? what's going to stop people from setting their phones to immediately delete message on receipt? and personally, that infringement on privacy is a little much. and who waves their phone around enough for cops to see when they're texting, anyway? and how does a cop know if you're texting or dialing your phone? they didn't ban dialing, but, to me, it's all the same thing. looking at your phone and punching keys. anyway. what do you all think? it's been a little while since i've had a chance to post anything. the weekend was full, with going out friday night with a group of people and the him, then heading out to the ranch saturday - and taking puppy lucy to see her sisters and brother, then going to a concert and socializing at the beacon till late saturday night, then going to breakfast and loading furniture and driving to douglas sunday to unload it at the him's mother's house, and bringing a dryer back for me to use. then heading out to feed sunday evening and remembering i still needed to finish cleaning the roundup office.... it was busy, but a good weekend and got to visit with a lot of people during those evenings at the beacon. here are some photos of lucy out at the ranch. becky's come up with several great names for the two females they're going to keep - like annie oakley and cattle kate - but bob has vetoed them all. so now the runt's just 'runty' and i don't know what they call the whiney spotted one. 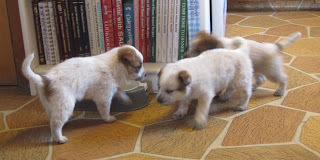 hopefully they get christened before 'runty' sticks. the male is headed to cody soon, i think.